As a born and bred Southerner, I would consider my palate well trained for the complexities of many Southern comfort foods. I’d even be willing to place a sizeable bet that not a week has passed in my 21 years on this planet when I haven’t indulged in some deep fried or supremely buttered dish. Which is why I also feel I possess some authority when it comes to handing out a Southern Superlative or two, especially when the right dish just begs to be eaten again and again. 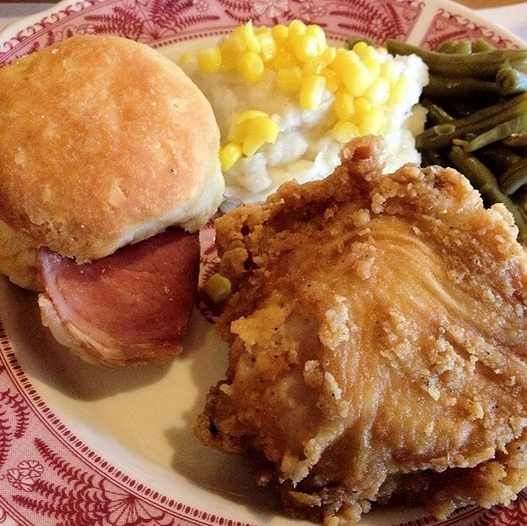 Recently, on a trip to Boone, NC, I stopped in at the Dan’l Boone Inn and tasted a little slice of heaven in a perfectly fried piece of poultry. And I’m not kidding when I say it was The Best Fried Chicken in the World. It was so perfectly golden brown, crispy and fried but still juicy, tender and tasty that I helped myself to THREE CHICKEN BREASTS. THREE. Which isn’t to say that the rest of the family style spread wasn’t delicious. Our small family of four kept the country styled steak, mashed potatoes, green beans, homemade biscuits and gravy coming. We were also served corn, coleslaw, and fried apples. 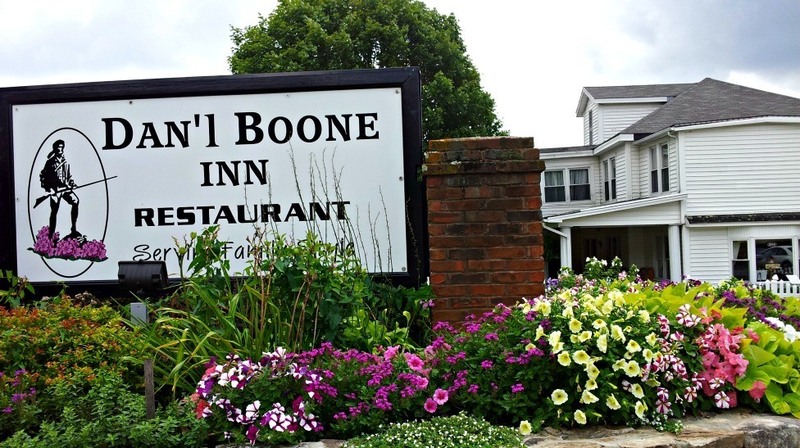 Famous for it’s family style service and old timey atmosphere, the Dan’l Boone Inn is certainly a major tourist attraction in Boone’s humble mountain town. Male waiters wear a navy short sleeved button down and slacks, while waitresses wear garb you might see on an episode of Little House on the Prairie— full skirts and blouses with aprons. Decor inside the restaurant is quite similar, wood paneled floors, walls, chairs, and antique wallpaper and decorative ornaments adorn dining rooms, akin to what you might see in a Cracker Barrel, but more unique. But back to the main attraction: the food. We stopped in for an early lunch on a weekend in mid July and were seated right away. The waiter took our drink orders–sweet iced tea all around–and brought out our drinks with a small starter salad. The salad wasn’t spectacular, iceberg lettuce served with ranch dressing, but considering we didn’t want to fill up on the appetizer anyway, there weren’t too many complaints around the table. As soon as we pushed our salads away, the table was filled with the menu items for the day. 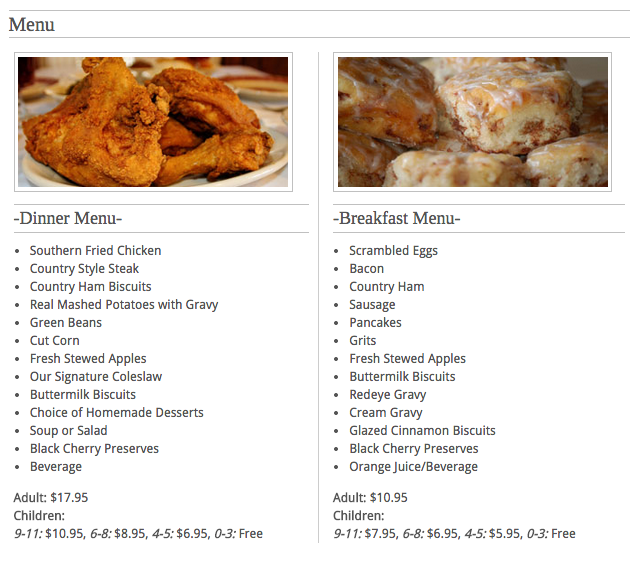 You can glance at the typical lunch/dinner menu, provided by the Dan’l Boone Inn’s website, below. And for our family’s relatively high expectations, our lunch certainly didn’t disappoint. Per restaurant policy, we were served moderate portions of all dishes, but were told that the plates were “bottomless” and we’d be able to ask for seconds and thirds of all dishes except for the country ham biscuits. 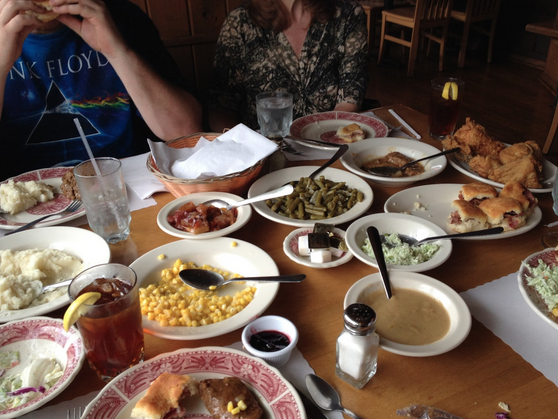 We pretty much ordered seconds of everything, and my brother requested thirds for the country style steak. What we didn’t finish, we took home for later. While the price tag for a lunch is pretty staggering, the “bottomless” serving style can be thought of as a sort of sit down buffet, which justifies the cost. Also, considering each person at our table filled themselves with so much rich food, we weren’t hungry for dinner. So, technically, the our $17 lunch was actually a $8.50 lunch and $8.50 dinner. Though I haven’t been back to boone since July, I’m planning on heading back soon enough just for another great meal and some family time. Oh, and did I mention for the fried chicken?